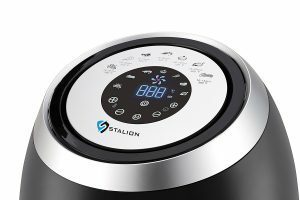 StalionX Digital Air Fryer is a 7-in-1 programmable multi-functional electric powered countertop style deep frying unit with a 5 liter frying pot and a 3.6 liter frying basket capacity. You can make a variety of tasty meals with it that are free of grease or extra unwanted calories but with the exact same taste of the deep fried. The fat is up to 80% less than the food cooked by the regular oil deep frying methods. So you can enjoy your favorite fried foods without feeling any guilt. It has an LED touchscreen that shows 7 different items with different time and temperature settings. With the Rapid Air Technology, hot air is circulated evenly throughout the interior and you get your fries, fish, chicken or turkey with a crispy and crunchy exterior and moist and tender interior. You can make delicious and healthy oil-less French fries, chicken, turkey, charbroiled meats, and desserts. You can use it as a steamer, toaster, pressure cooker, convection oven, grill pressure cooker and more. StalionX AirFryer weighs 12.92 pounds and is compact in size with the measurements of 16.8 x 14 x 14 inches. You can set the time up to 60 minutes and the temperature between 175 and 392 degrees Fahrenheit. It easy to set up and operate by just pressing a couple of buttons, set the time and temperature and press the start button. The 5 liter non-stick coating frying pot and the 3.8 quart basket are removable and can be cleaned in the dishwasher. It has the Automatic Ready Alert Shut On/Off security alert function with the double circuit and overheating protection cutoff mechanism. It stays put and stable on the kitchen counter with the anti-slip feet along with the cool to touch heat resistant and shock-proof handle. You can prepare meals quickly and easily for just yourself or your family. You can cook a variety of ingredients from fresh or frozen but frozen will take a little longer depending on what you’re cooking. The 1500-watt power AC motor (110V /220~240V, 50/60Hz) is powerful and efficient yet the unit runs quietly. You can cook chicken and other ingredients with zero or very little oil and salt and get results similar to deep fried. The food is cooked quickly (in half the time) and evenly and with great taste and texture- crunchy on the outside and soft on the inside. It is built sturdy with good quality components and should prove durable and not break easily. It is friendly to the environment with up to fifty percent energy efficiency as you don’t need to heat up your large oven to make something small. The StalionX Air Fryer is something you can use every day for making quick, healthy and tasty meals and offers really good value for money over time.